Any time you need to buy new HP B8338 printer cartridges, then Cartridge Save will have just what you need! Actually finding matching ink cartridges is a cumbersome bother, especially when it entails the need to go to or maybe get in touch with lots of providers. On the other hand, replacing B8338 printer cartridges doesn't necessarily need to be a stressful undertaking. Buy all of your HP B8338 printer cartridges here at Cartridge Save and you're going to gain not merely treasured time, you will also lower your expenses. You can expect free next day delivery which is included on every last order of cheap HP ink cartridges, no matter what order size. All HP B8338 ink supplies purchased from Cartridge Save are always protected by our money back refund policy. With phenomenal bargains such as these it's impossible not to save Cartridge Save! A real printing beauty, the Photosmart Pro B8338 gives you a basic but powerful machine for producing everyday documents and quality photos. It boasts a superior maximum print resolution of 4800x1200 dpi, satisfying even the most discerning eyes. Colour interpretation is great, and light and shade tones are outstanding. The Photosmart Pro B8338, however, is limited to printing, and does not have wireless interface. The Photosmart Pro B8338 is simple, with the paper tray right on the front and control buttons on the side for quick finger access. It measures 574.5 x 408.5 x186.1 mm, making it a desktop friendly choice for households or small businesses. The secure USB connectivity ensures a stable connection between your computer and the Photosmart Pro B8338. The machine is capable of printing up to 31 black pages and 24 colour pages per minute at its fastest mode. It produces outstanding photos and has a monthly duty cycle of 5000. The Photosmart Pro B8338 also has a 32MB internal memory. 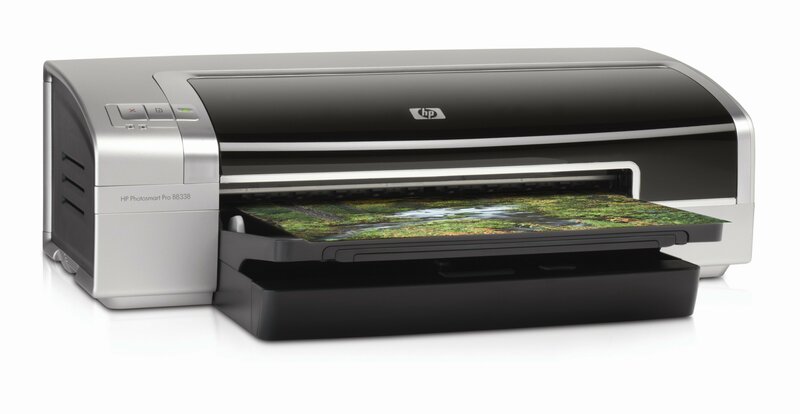 The Photosmart Pro B8338 lacks wireless capabilities and is not network ready, which means you need a dedicated computer for printing. It is a no-fuss printer whose job is just to print — no added extras.